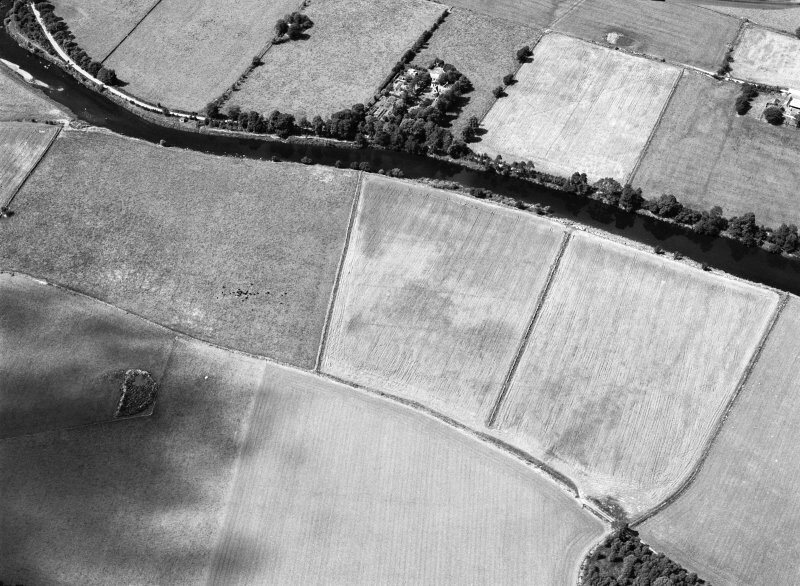 Oblique aerial view centred on the cropmarks of the Roman Temporary Camp at Burnfield with the enclosure at Brownhill Wood adjacent, looking to the NW. 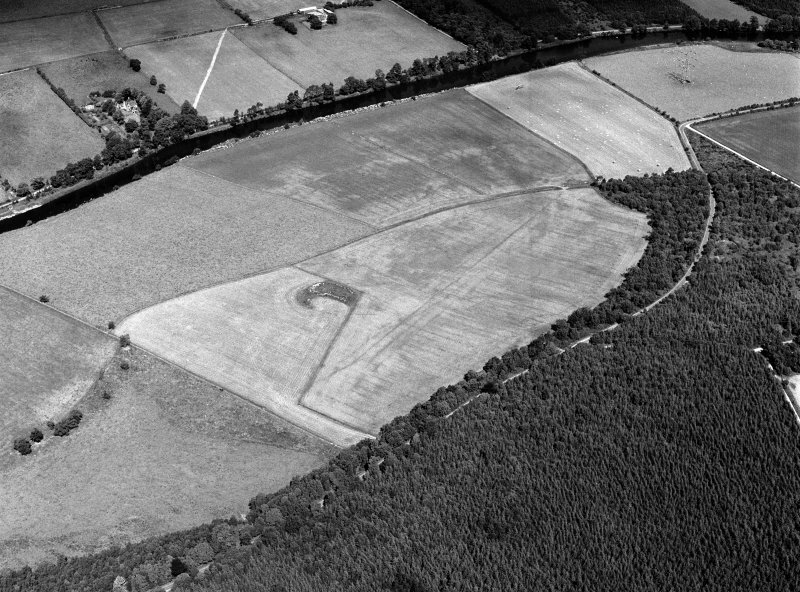 Oblique aerial view centred on the cropmarks of the Roman Temporary Camp at Burnfield with the enclosure at Brownhill Wood adjacent, looking to the ESE. 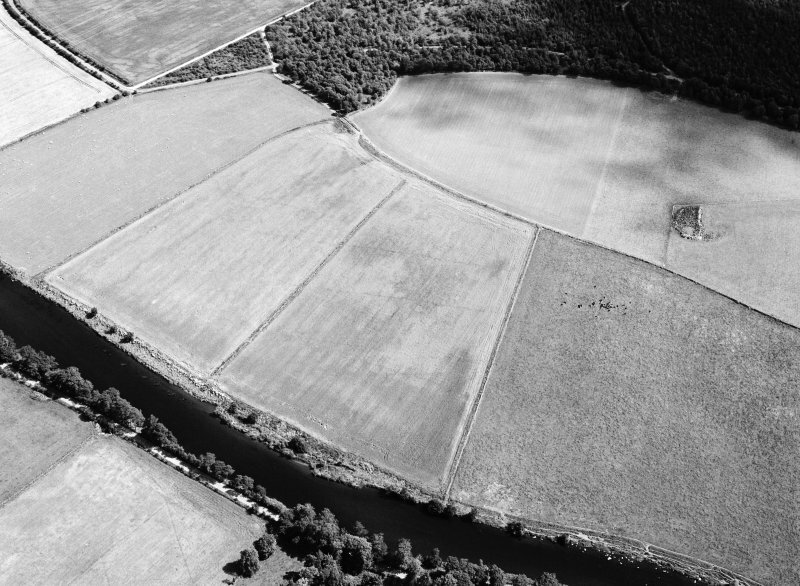 Near the farm of Burnfield on the south side of the river Deveron, by Rothiemay, cropmarks seen in 1982 suggested part of a marching-camp. 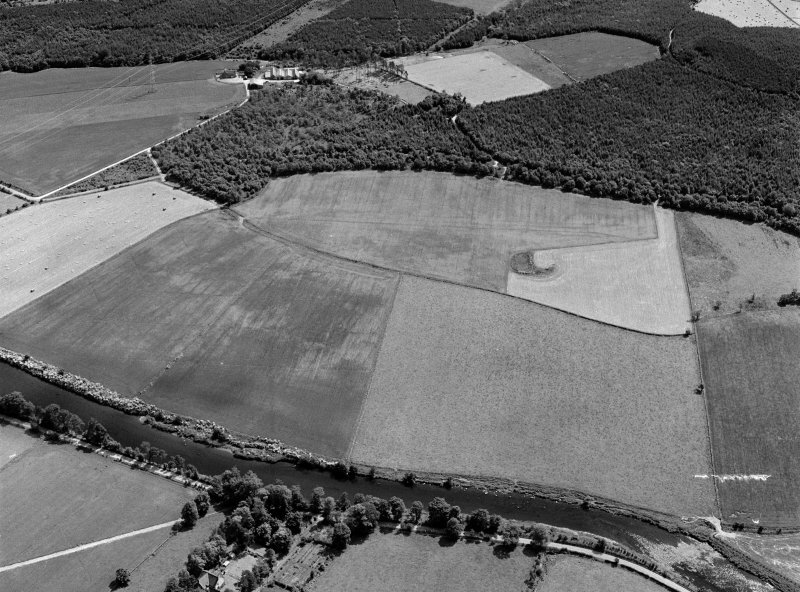 Trial trenches by I Ralston and J K St Joseph identified the ditch of the camp at three points on the NE side: c. 185m (600ft) of both the north-east and south-east sides appear on aerial photographs. The area enclosed is unknown but is unlikely to exceed 16 ha (40 acres) on topographical grounds. The very small ditch (0.69m deep) invites comparison with Ythan Wells I and Auchenhove (NJ63NE 2.02 and NJ45SE 5 respectively). S S Frere 1985; Information from Dr St Joseph. 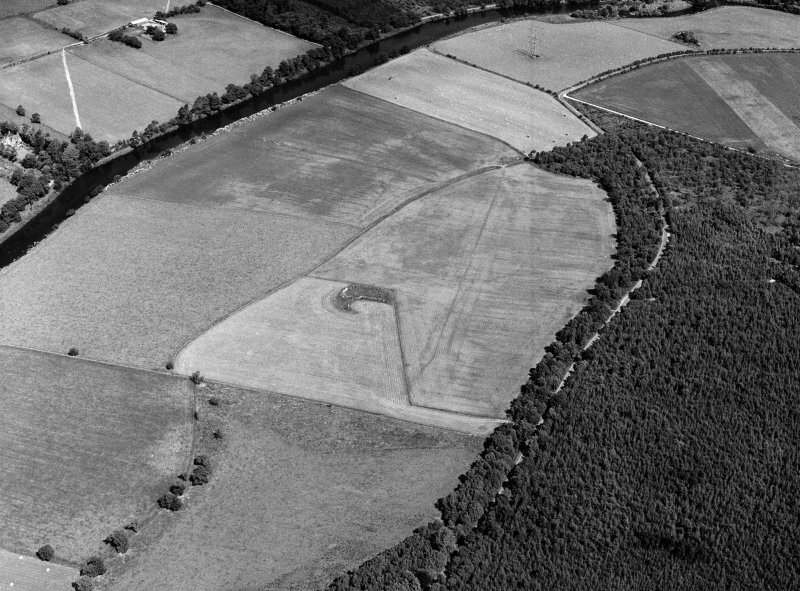 The probable camp of Burnfield was first identified from the air by Ralston in 1982, although part of the camp is visible as cropmarks on air photographs taken by Cambridge University in 1976. The site lies just to the east of the River Deveron, south-west of Milltown of R othiemay, on a relatively flat terrace, before the ground slopes gently up to Brown Hill to the south-east. Those seeking a camp between Ythan Wells and Auchinhove had suggested Rothiemay parish as a likely location (for example, Burn 1953: 133; Henderson-Stewart 1960: 83–4). Although the camp lies within Huntly parish (Huntly lies over 7km to the south), it is close to Rothiemay. The camp currently lies in improved pasture. Parts of the north-east and south-east sides, including the east corner, are visible on air photographs. St Joseph’s plan in the RCA HMS (DC 37267) also includes the north corner and short stretches of the adjacent northeast and north-west sides. It is presumed that these were recovered through trenching. This evidence suggests that the north-east side was about 327m in length. Information supplied to Maxwell and Wilson suggested that 360m of the south-east side had been traced (1987: 34). Thus the camp measures some 327m by possibly at least 360m, enclosing a minimum area of 11.7ha (29 acres), and St Joseph noted that it was unlikely to have exceeded 16ha (40 acres) on topographical grounds (Frere 1984: 273). The ditch was recorded as measuring 1.4m in width but only 0.5m in depth (Maxwell and Wilson 1987: 34). No obvious entrances are known, but there are various gaps in the perimeter ditch.